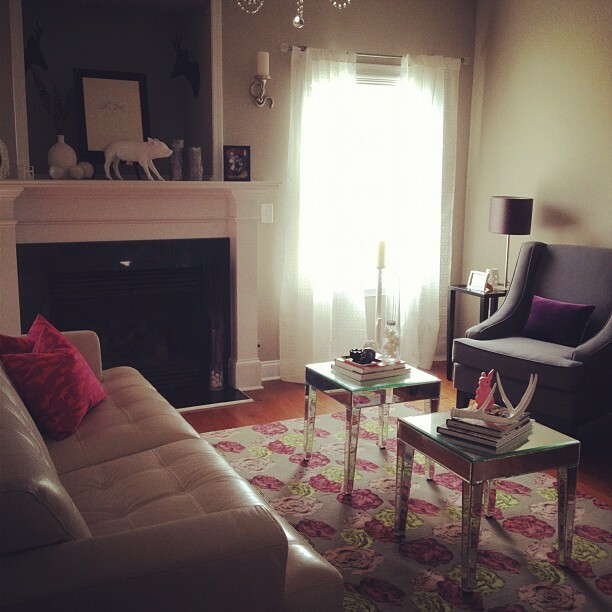 I don't think I've ever shared pictures of my livingroom on Hello Jack - or have I? Well... in any case, here's a glimpse at our home. Let me start by saying that my home is a work in progress, things are constantly changing. Our living room features gray walls (Sherwin Williams Amazing Gray), a fantastic chevron wall which my husband painted himself - yes, he's awesome - and lots of pops of colors. My most prized possession is my Porcupine Quill Mirror. It was a pain to put up but it was worth it, it's simply stunning! If I had to describe the style of this room I would called modern glamorous. For more images of our home make sure you check my Decor/Design blog - Layers of Meaning. Gallery wall - work in progress. Want to see the livingrooms of some of your favorite bloggers? Make sure you check Kelly's Korner for an inside look! We just added some more frames/art work. I will post an updated image soon. What a beautiful home you have! 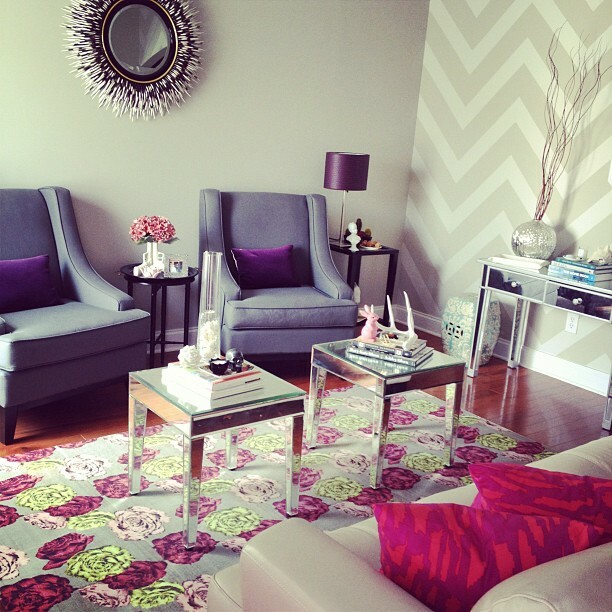 Adore the chevron wall and the chairs are perfection! Thank you, it's still a work in progress. 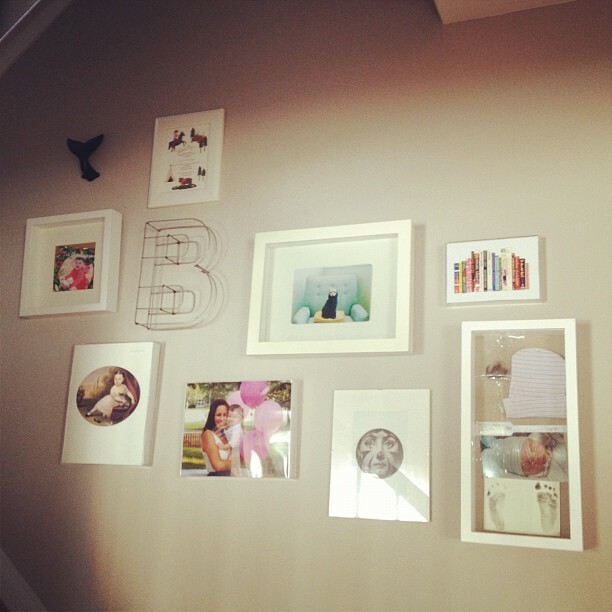 Very cute... LOVE the chevron wall! LOVE that chevron wall. Your husband is a beast. Mine never would have agreed to that! 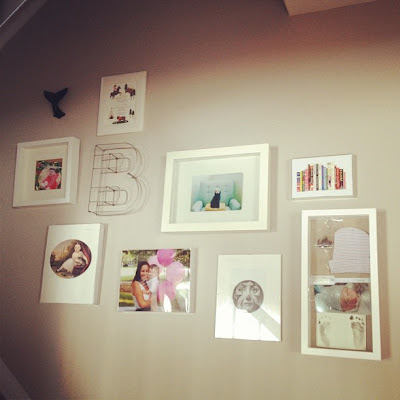 I love the chevron- I think I am going to do it in white/melon on a wall in my daughter's nursery. That mirror is simply devine. I'm in love with it! The chevron wall is stellar. I adore your style. The chevron wall is gorgeous. Love it! omg. I'm in love with your chevron wall. It's AMAZING! Love the cheveron wall! So beautiful! I love your living room! It just looks --FUN!!!! Where is your wire "B" from? It's from Urban Outfitters. I got it on sale for $2.99! Going to buy one this week then! Okay, one more question, the grey chairs, where are they from? They are from Target.com. Not sure if they are still available. Love this!! We are moving to a new house in a few weeks and this is kind of the look I am going for! Oh I'm so jealous you live in this room every day! It's beautiful. I love the mixing of pattern and color!!! I also love the porcupine mirror. It was definitely worth the time you had to hang it. I'm having such fun visiting the SUYL participants this week! So many talented bloggers. Holy moly!! That chevron wall is incredible!! I love it! Your living room is just beautiful! Stopping by from the KK linkup! Adorable!!! I love how light and bright it fills! Okay, I need some modern glamour in my life! You have beautiful style! Great job! I love everything, from the colors to the furniture arrangement and the art! Love! Wow! What a fab-u-lous living room!!! 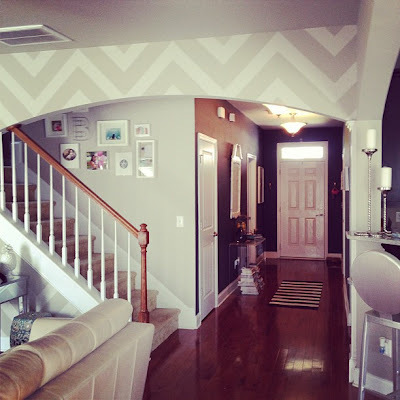 Love the chevron wall, the colors, patterns....just incredible!!! Love it!!! Think it may be my most favorite one!!! So current!!!! Coming to you from Kellys Korner Blog. Love, love, love it all! Chevron wall is amazing, and those tables are SO cute.